A Note on the Term ‘Handsaw’: Technically all saws can be classed under the term ‘handsaws’ as this is a general term for all saws used by hand (not machines), however, the term ‘handsaws’ can also refer to a specific saw which is described as a large panel saw. In this guide we will be referring to a handsaw as a name for a specific saw. There are 2 types of saw teeth patterns, ripcut and crosscut. Ripcut is where the teeth are sharpened straight or square across, this tooth pattern is designed for cutting with or along the grain. Crosscut is where the teeth are sharpened from alternating sides to create bevelled points to the teeth, these teeth are specifically designed for efficient cutting across the grain of the wood. For both types of saw, the teeth are bent slightly (or ‘set’) in alternate directions (this is called ‘set’) using a sawset (see more in our ‘Setting up & Sharpening Guide’) as this allows the cut to be slightly wider than the the thickness of the saw plate (blade) itself, enabling you to move the saw into and through each cut with ease. You can sharpen any saw to either one of these two tooth patterns, however it doesn’t make too much difference in saws with smaller teeth so Paul recommends sticking with a ripcut for all back saws and saws with more than 8 PPI to get you started. As the teeth get bigger, it is more important to have dedicated saws, one to each tooth pattern. To read more about using saws, click here. There are three main types of saws; backsaws, backless saws and frame saws, the difference is the way the blade is supported. 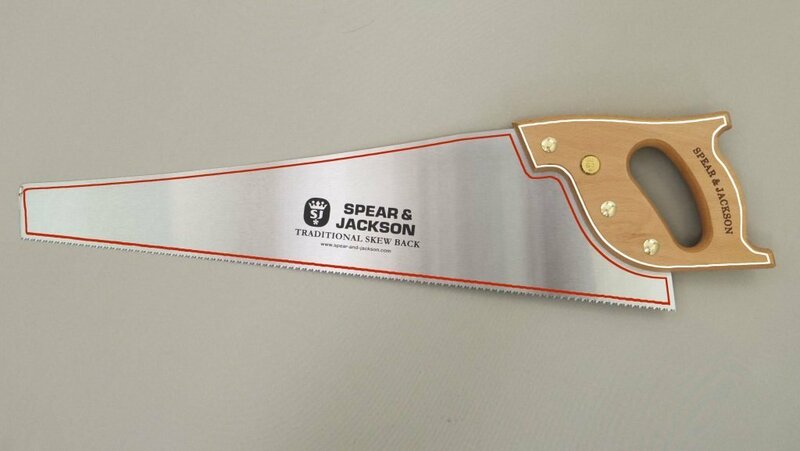 Backsaws have a metal rib running along the full length of the back of the blade and frame saws have a frame structure which allows tension to be applied to the blade itself. Backsaws can range in size up to 14” (355mm), and the backless saw, which relies on a certain level of stiffness in the blade alone for solidity in the cut, can range up to 30” (762mm). 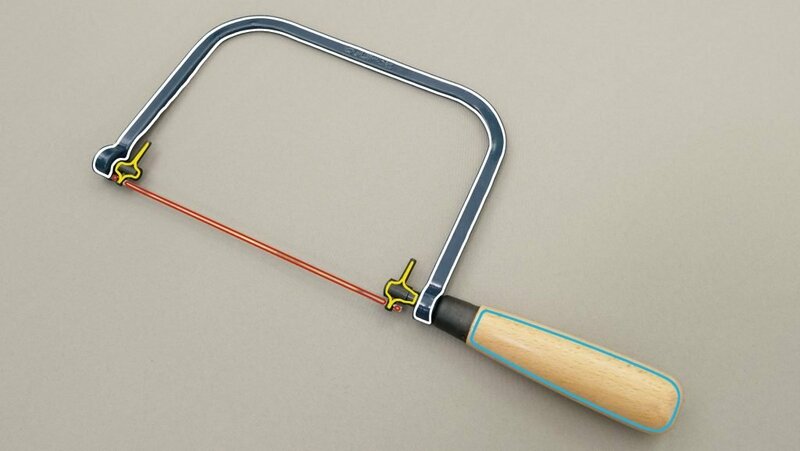 Handsaws- These are used to remove large amounts of unwanted material and to develop roughsawn material ready for surface planing to final sizing. For saws with 8PPI or less the tooth pattern, ripcut or crosscut, determines whether they can cut with or across the grain. The blade should be flexible and thin, if it is too thick it takes more effort and is much harder to use. Handsaws can range with number of teeth on the blades, from as much as 12 Points Per Inch (PPI) down to as little as 4 PPI. Larger backsaws are referred to as ‘tenon saws’ and the smaller backsaws are called ‘dovetail saws’. 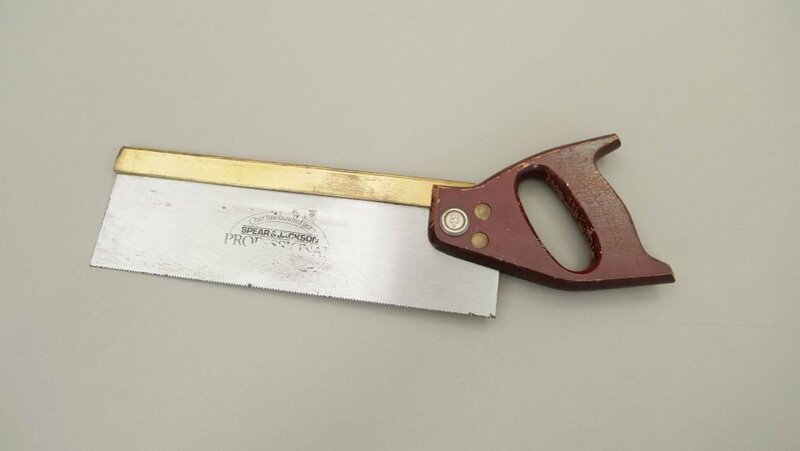 ‘Gents saws’ are similar to a dovetail saw, however they can be identified by their inline handle. Dovetail Saws- These are the smaller backsaws which are mostly used for dovetailing, these are small versions of the tenon saw. Dovetail saws usually have a maximum PPI (points per inch) of 16, however you can get finer blades which have 18-32 PPI. The finer saws (those with smaller teeth) are much trickier and sometimes impossible to hand sharpen and set as the teeth are so small they are harder to see which makes them easier to accidently file through and remove a whole tooth. Tenon Saws (Can also be known as Sash Saws, Back saws and Carcass Saws)- Often used for cutting tenon joints but can be used for a wide variety of applications. 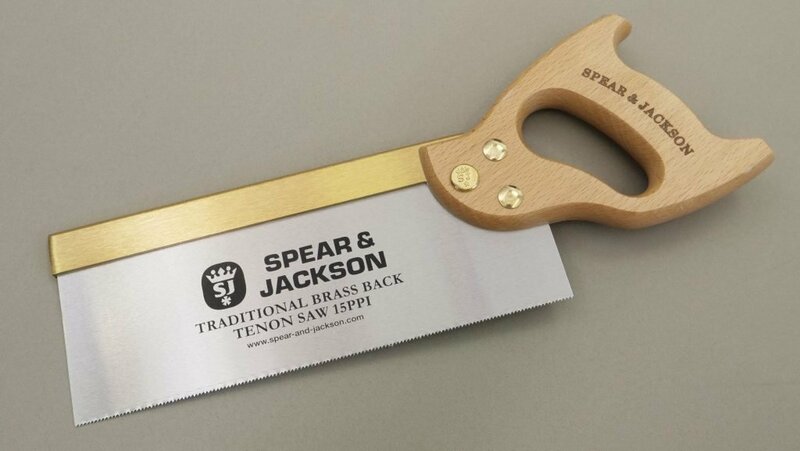 It is made up of a wooden handle with a wide blade made from thin steel. There are several different lengths of tenon saws ranging from 10-14”. Coping Saws- Coping saws are used for curved cuts or cuts that have to change direction, they can cut tight curves as they have a very thin steel blade with an adjustable angle. The ultra-thin blade is supported by a strong steel frame that adds tension to the blade. The height of the frame back from the blade determines the cutting depth, also known as the ‘throat’, usually 5” (127mm). 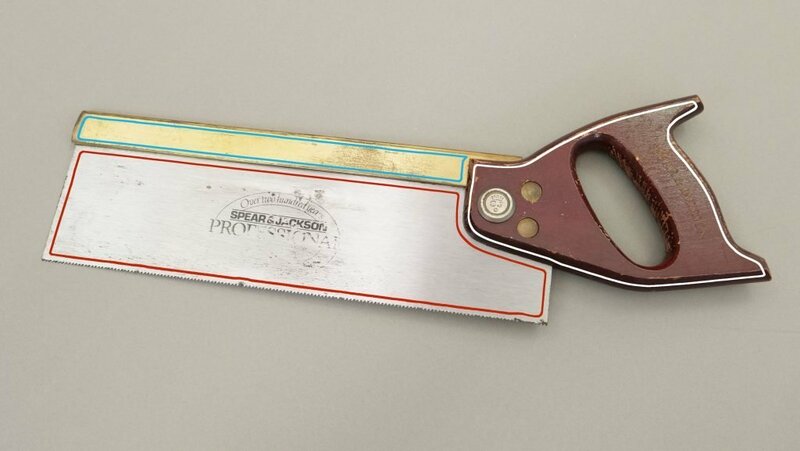 Disposable Saw- A saw not made to last, often identifiable by the handle but more evident by the teeth type which are often darker than the main body of steel (having been hardened). 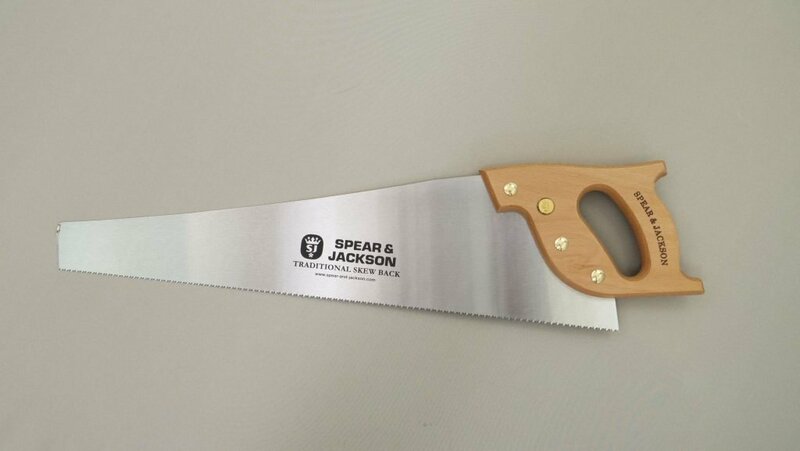 A plastic handle with hardpoint teeth are good indicators that the saw is disposable and cannot be sharpened. 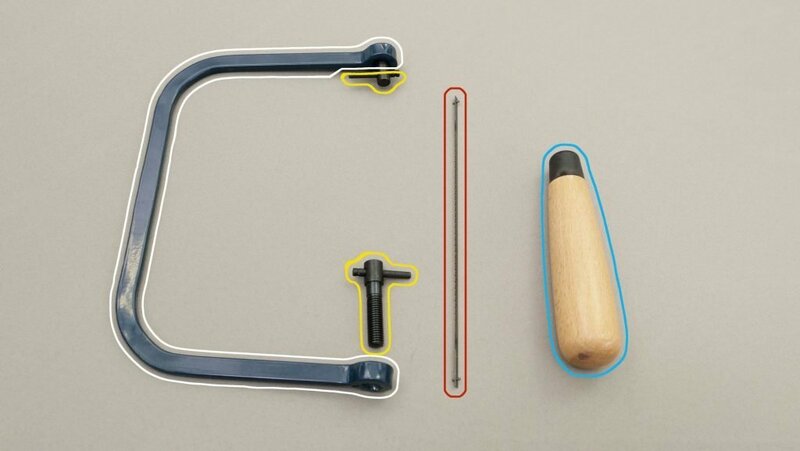 *The adjuster that passes into the handle is also the tensioner. Push- Me Pull- You Saws- Subtle Changes?